I came across this article this morning. The author chronicles a recent period of sadness in her life. In the latest installment, she relates how reflecting on God’s artistry made her fully aware of His care. Read the full article here. It spoke volumes to me. Life’s transitions,as painful and uncomfortable as they may be, are just a part of God’s beautifying process. I have an older sister who wears wisdom like perfume. She dabs it lightly on her collarbone, on her wrists, maybe one last mist before she walks out the door.You’re bound to catch a whiff of it if she brushes past you. But only those closest to her get the most potent dose. The scent of her most recent spritz is still floating around my senses. Recently, I was talking to her about a potential suitor. We were both trying to find silver linings but it was becoming painfully clear that there were none. After we placed him in the “no go” pile, she said something that will stick with me for a long time. It was about a toy. I loved to play with my younger cousins when they were babies. Kiss their soft chubby cheeks. Laugh as they tried to repeat after me in their baby accents. I especially liked to watch as they tried to make sense of the brightly colored toys that were stationed in their rooms. 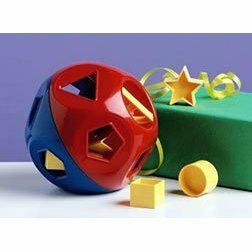 There was one toy called the Shape Ball. The ball had openings in the shapes of a triangle, square, circle, star, pentagon, etc. The goal is to match the shape of the opening with the shape of the piece and drop it inside the ball. My cousins, being babies, couldn’t get the hang of it. They didn’t understand that the circle couldn’t be placed inside the star opening. The circle with its smooth curves and the sharp angled star slot weren’t the same. After a couple of minutes of trying and dotting the air with squeals of frustration, they would pound the circle into the opening until it eventually dropped inside the ball. But it’s not supposed to be there. we can force a connection with someone who doesn’t match us, a person who isn’t on our level. …various things can make us bang the bond into looking like it works. When, in actuality, it doesn’t. And you’re left living with a circle when you’re meant to be with a star. I don’t want to live with a circle. There is a definite sad truth in that statement. Settling or taking less than what you desire or deserve. I don’t mean opting for a man who’s 5’9 because there aren’t any 6’1 men around your neighborhood. But I mean dealing with a mean spirited woman because you feel you have no other option since your looks are gone. Trusting your heart with a unapologetic philanderer because you’re 29 and need to start having babies soon. Standing before God at the altar with an irresponsible and immature person because you want to be married and you need it to happen now. I wonder did they feel that they were so unworthy of a well-rounded reciprocal relationship that they went behind prison walls? Did they decide to settle for a man that they will never be able to share a home with because it’s better than having no man at all? I wonder at what point in their life schedule did they decide it was time to settle. There is such danger in that. You may end up missing the person who crosses every one of your “t’s”, the one that God has designated for you. And why? All because you feel you “don’t” look or act or sound the right way? All because you didn’t wait to wait another 3 years, another month, one more week? The want for marriage is good and comes from God. But so does the when. Let’s trust God’s timing and believe that the beauty He’s marked us with is more than our eyes and any mirror can realize. My co-worker Amy and I listened to her, me stirring my cup of coffee and Amy sipping her water. Both of us with amused expressions on our faces. For the past few months, Rebecca had been trying to convince Amy and I to date another employee, Roy. Nearly every week, she would drop barely veiled hints about his attributes and availability. One day this past week, my desk phone rang. It was Rebecca. Your husband is on the floor. When I asked what she meant, she responded, “You’ll see what I mean in a minute.” A couple of minutes later, Roy comes by with my paystub. I hadn’t gotten a chance to converse with Amy about the whole situation. But I finally got the opportunity when I sat next to her at a company luncheon. I leaned over to her and said in a hushed tone, “So has Rebecca been talking to you about…?” I trailed off and glanced at Roy, who was standing a few feet away. After the luncheon, both of us decided to pay Rebecca a visit where she apologized. She herself had a morning encounter with Roy that swiftly changed her opinion. I’m not sure what transpired but it must have been serious since there were no remnants of her matchmaking left. “He just seemed like such a good guy,” Rebecca stated, shaking her head. Happy that a date made in hell had been averted, Amy and I walked back to our desks, agreeing to meet for lunch soon. “We gotta come up with strategies so we can get married soon,” she said, half-jokingly. It’ll be interesting to see what we come up with :). Though I trust and often seek Rebecca’s wisdom and insight about faith, love, and all areas of life I haven’t gotten to yet, I wasn’t sure about her accuracy on this one. My gut, heart, and head were not drawn to this man. And it turns out I was right. Lesson of the day: It’s always good to trust yourself.